Jōdo Shinshū (浄土真宗 «True Pure Land School»), also known as Shin Buddhism, is a branch of Pure Land Buddhism derived from the teachings of the Japanese ex-Tendai preacher Shinran. Shinran originally practiced as a low-status monk, in a Tendai nembutsu worship hall. Then, just one-year before finishing the twenty-one year Tendai training course, he left the temple on Mount Hiei in disillusionment over his capacity for spiritual practice and also in disgust at widespread monastic corruption. Following a vision Shinran sought out and studied with Honen (1133-1212), founder of the Jodo Shu sect and another Tendai drop-out, who taught the exclusive and single practice of saying the name of Amida Buddha. Six years later Honen and several of his disciples, including Shinran, were split up and exiled to different parts of Japan. Shinran then spent many years traveling throughout Japan and preaching to the peasant class, who found Shin Buddhism to be attractive due to its non-exclusivity and simple practice (see Ikko-ikki). Later in life he settled down and devoted his efforts towards writing the Kyogyoshinsho and other works. Shinran always considered himself a disciple of Honen but in exile his religious thought developed differently to that of this teacher. Consequently after Shinran’s death his family and followers started a process of institutionalisation which led to the Jōdo Shinshū becoming an independent sect. Though Shinran wrote many works of his own, his most famous words were recorded by his disciple Yuien in an infamous text called the Tannisho. This text is used by the tradition as a succinct doctrinal handbook against the heretical interpretations of Shinran’s teachings that have sometimes arisen. Shinran’s thought was strongly influenced by the doctrine of mappō (末法), or the decline of the Dharma (the Buddhist teachings). Shinran saw the age he was living in as being a degenerate one where beings cannot hope to be able to extricate themselves from the cycle of birth and death through their own power, or jiriki (自力). 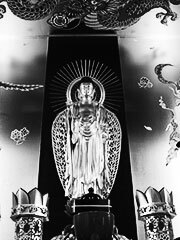 For Shinran, all conscious efforts towards achieving enlightenment and realizing the Bodhisattva ideal were contrived and rooted in selfish ignorance; for humans of this age are so deeply rooted in karmic evil as to be incapable of developing the truly altruistic compassion that is requisite to becoming a Bodhisattva. It should be noted however that many modern commentators feel that Shinran’s understanding of mappō is highly psychological and subjective, rather than eschatological, though this is a point of some controversy. Due to his consciousness of human limitations, Shinran advocates reliance on tariki (他力) (Other Power) — the power of Amida Buddha’s limitless and infinite compassion made manifest in Amida Buddha’s Primal Vow — in order to attain liberation. Shin Buddhism can therefore be understood as a «practiceless practice,» for there are no specific acts to be performed such as there are in the «Path of Sages» (the other Buddhist schools of the time that advocated ‘jiriki’ (‘self-power’). Accordingly within Jōdo Shinshū the nembutsu (念仏): Namu Amida Butsu (南無阿弥陀仏) («I take refuge in Amida Buddha») Pure Land chanting practice is seen in a new light. The nembutsu becomes understood as an act that expresses gratitude to Amida Buddha — furthermore, it is evoked in the practitioner through the power of Amida’s unobstructed compassion. Therefore in Shin Buddhism, the nembutsu is not considered a practice, nor does it generate karmic merit. The goal of the Shin path, or at least the practicer’s present life, is the attainment of shinjin (信心 True Entrusting) in the Other Power of Amida. To achieve shinjin is to unite one’s mind with Amida through the total renunciation of self effort in attaining enlightenment; to take refuge entirely in Other Power. Shinjin arises from jinen (自然 naturalness, spontaneous working of the Vow) and cannot be achieved solely through conscious effort. Shinjin develops over time through «deep hearing» of Amida’s call of the nembutsu. Jinen also describes the way of naturalness whereby Amida’s infinite light illumines and transforms the deeply rooted karmic evil of countless rebirths into good karma. It is of note that such evil karma is not destroyed but rather transformed: Shin stays within the Mahayana tradition’s understanding of sunyata, or non-duality / emptiness, and understands that samsara and Nirvana are not separate. Once the practicer’s mind is united with Amida and Buddha Nature gifted to the practicer through shinjin, the practicer attains the state of non-retrogression, whereupon after his death he will achieve instantaneous and effortless enlightenment. He will then return to the world as a Bodhisattva, that he may work towards the salvation of all beings. Jōdo Shinshū itself has many sub-sects which tend to be either independent, based on Shinran’s family lineage, or centered on places he lived. The largest branch is the Hongwanji-ha sect. This sub-sect is further divided into two, the Hongwanji-ha Hongwanji (which is often abbreviated to Honpa Hongwanji or more commonly, Nishi-Hongwanji) and Daiha Hongwanji (or Otani Hongwanji, more commonly referred to as Higashi-Hongwanji). Neither of these can be broken down further, and Nishi is the larger of the two. In the United States, Nishi-Hongwanji operates as the Buddhist Churches of America and Honpa Hongwanji Mission of Hawai’i. Excepting certain Jōdo Shinshū inspired New Religious Movements the various sub-sects hardly differ on doctrinal matters but have a wide variety of liturgical styles.